A new unique hero for you fine Heroscapers to consider from C3V WAVE 15. The figure used for this unit is a Legendary Encounters figure. Its model name is Dwarf Warrior 20034. Last edited by ZBeeblebrox; April 18th, 2012 at 09:53 PM. The figure used for this unit is a Confrontation figure from the Rams of Acheron set. It is available in the Ram Army Box. The name of the figure is "The Great Skull". Last edited by ZBeeblebrox; November 25th, 2012 at 11:49 AM. The figures used for this unit are AT-43 UNA Star Troopers Unit Box. Sneak Peek - A Common Hero in development by the C3V WAVE 15! The figure used for this unit is a Heroclix figure from the Armor Wars set. Its model name is Paladin/004, 005, 006. The figures used for this unit are Confrontation Scorpion Clones Unit Box. NOTE: There are four types of Scorpion minis: Clones, Crossbowmen, Sentinels and Skorize. One or more of those types will be pictured on the C3V card, but they are all similar enough to each other to serve as excellent proxies. Two of the figures used for this unit are Reaper figures from the Legendary Encounters line. 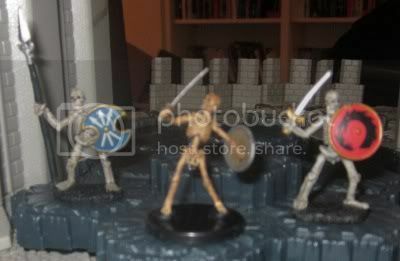 The model names are Skeleton Spearman and Skeleton Swordsman. The third figure used for this unit is a Pathfinder figure from the Pathfinder Battles: Heroes & Monsters set. Its model number and name is 7/Skeleton. Last edited by ZBeeblebrox; February 29th, 2012 at 07:55 PM. Sneak Peek - A Unique Squad in development from C3V! They are available from the Ram Army Box (4 figures), Black Paladins. The figures used for this unit are Confrontation figures from the Wolfen of Yllia set. They are available in the Wolfen of Yllia Hunters Unit Box (4 figures) and the Confrontation Starter Set (4 figures). The name of the figure is Wolfen Hunters. The figures used for this unit are Confrontation figures from the Wolfen of Yllia set. They are available in the Wolfen of Yllia Trackers of Shadow Unit Box (3 figures) and the Wolfen Army Box Set (3 figures). The name of the figure is Wolfen Shadow Hunters. Last edited by ZBeeblebrox; February 29th, 2012 at 07:56 PM. The figure used for this unit is a Confrontation figure from the Wolfen of Yllia set. It is available in the Wolfen of Yllia Throne of Stars Hero Box (2 figures) and the Wolfen Army Box Set (1 figure). The name of the figure is Oynx. The figure used for this unit is a Confrontation figure from the Wolfen of Yllia set. It is available in the Wolfen of Yllia Throne of Stars Hero Box (2 figures) and the Wolfen Army Box Set (1 figure). The name of the figure is Y'Anrylh.